wouldnt there also be a connection to when Laura did that 2 finger snap in the red room? Has anyone else noticed that the same atmospheric sound that was in the great northern with Beverly and Ben was around Diane when she was at the bar looking up coordinates for twin peaks? At first the sound is blocked out by the vacuum cleaner, signaling Diane's resistance to it, but after she decides to work on the mystery(let's rock), signaled by her turning away from the bartender, it becomes clearer. Also, the sound is in a different rhythm for Diane(more sporadic and directly focused on isolated elements of the sound), than it was for Beverly and Ben(going through different elements, smoothly flowing, etc.). 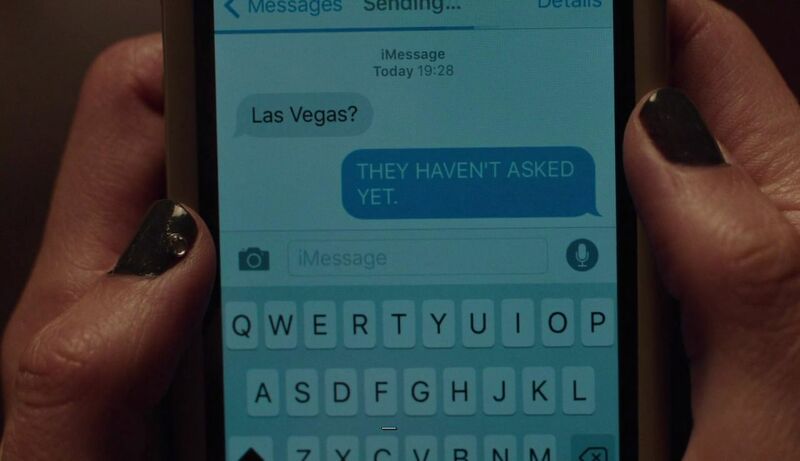 Also noticed that she switched to capital letters when she answers the Las Vegas message. A code somehow? We remember that text evil Coop sent in mixed letters was received by her phone in capitals too. What about rock as in 'rock, paper, scissors'? I think that Diane is actually in contact with Phillip Jeffries. It doesn't make sense that she'd be working with Mr. C, since she was so viscerally upset even seeing him (and genuinely confused). I think she's working against him, but in secret from the FBI. The text is capitalized to show that they're not the actual direct messages from Mr. C.
The first word Agent Cooper says after seeing the Let's Rock text on the windscreen is 'Diane'.